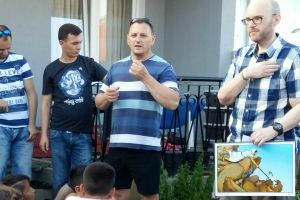 For over 12 years GRN UK Director, Kenny McKee, has led a team on an annual visit to the Roma gypsies of Kosova. The Roma people live in difficult circumstances, facing persecution and poverty because of their ethnic background. The Roma in Kosova are predominantly Muslim. Each year Kenny leads a team, in partnership with a local church, to distribute recordings and provide aid, especially to widows and orphans. Kenny's most recent visit saw a surprising breakthrough. Diana, a Roma girl, now serves on the church team. Her dad, a Roma Muslim community leader, openly resisted Kenny and the local church's community work and the countless blessings the community enjoyed from this. He did not want his daughter involved in church activities and was never really happy with us being there. 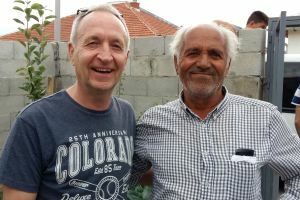 This year however, he was so welcoming; he allowed Kenny to conduct the Kids' Club in his front garden, where they told Bible stories, sang songs and played games, all the while watched by many from the Roma community across the street. He even invited Kenny into his home, where everyone enjoyed his generous hospitality and had a great time. This is an amazing miracle indeed! Praise the Lord for this incredible transformation. The GRN UK office also sends a large number of Sabers and flip charts to various countries. They recently sent 400 Look, Listen and Live flipcharts to Angola. As Kenny writes: "This gives us great joy that from our office here in the UK we can preach the Gospel to people through our recordings and materials without us going there or knowing who will hear. Here's a letter I got this week from Uganda. 'Thank you for the work you are doing for the glory of God. I write to acknowledge the receipt of the Saber MP3 players and entire packages . . . We have already started using them in evangelizing to the children and the youth. We use it during Sunday school and also after playing the games. The materials are of great benefit to us and the children in learning the word of God . . . Our church is growing and we are finding the recordings you sent to us very useful. Many souls are being won to Christ through listening to the Gospel recordings. We have 15 outstations in my parish and we need more Sabers.' "
Kenny recently sent this church three more Sabers loaded with five different languages and three sets of flipcharts with Sunday school lessons. We give thanks to God, for the great work done by Kenny, his wife Joan, and the UK team. It is heartening to hear these stories, as GRN UK brings the good news in their own language to so many communities spread across the globe. Please join us in praying for God to continue guiding and blessing this ministry.